At Gus’s Induction into the FL Central District Hall of Fame, the very first person he recognized and thanked was wife Marie. 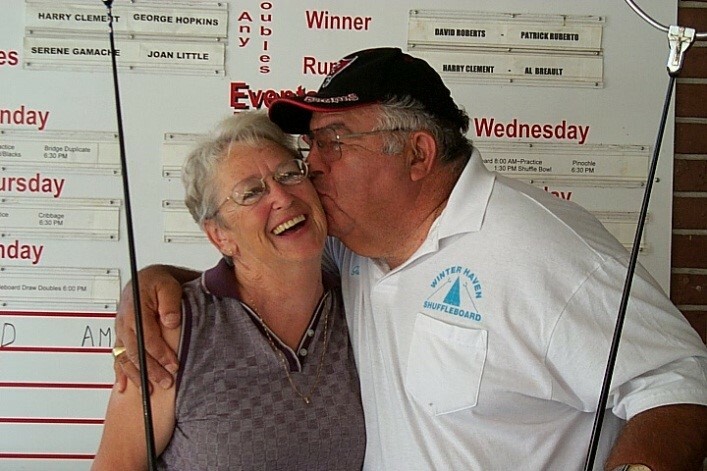 Marie served as his Secretary during Gus’s term of office as President of the ISA and has travelled extensively with Gus on his Shuffleboard Exploits!! Gus went on to thank his many partners who assisted him in gaining the requisite 100 points needed for entry into the HOF. Above left is Gus, caught in one of his many enthusiastic and exuberant moods as he embraces Lois at a St Cloud event where they finished in first place in the Championship event on January 8th, 1999. 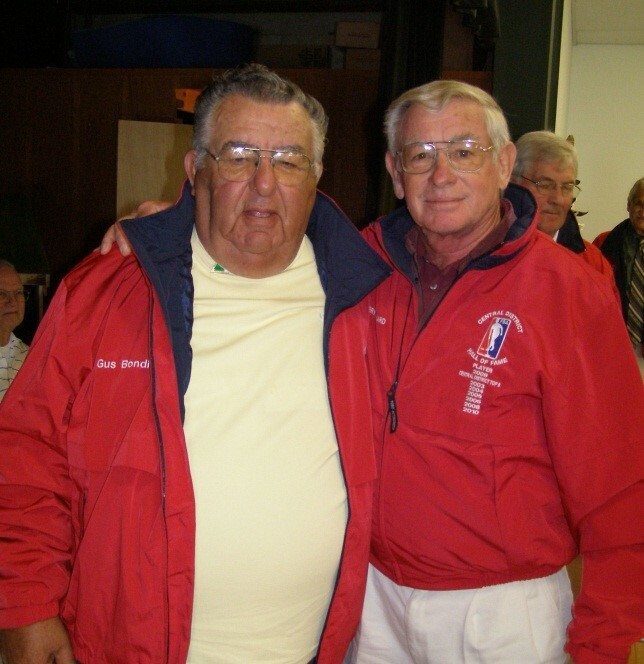 Gus was presented by Gerry Stannard, longtime friend and frequent shuffleboard partner. 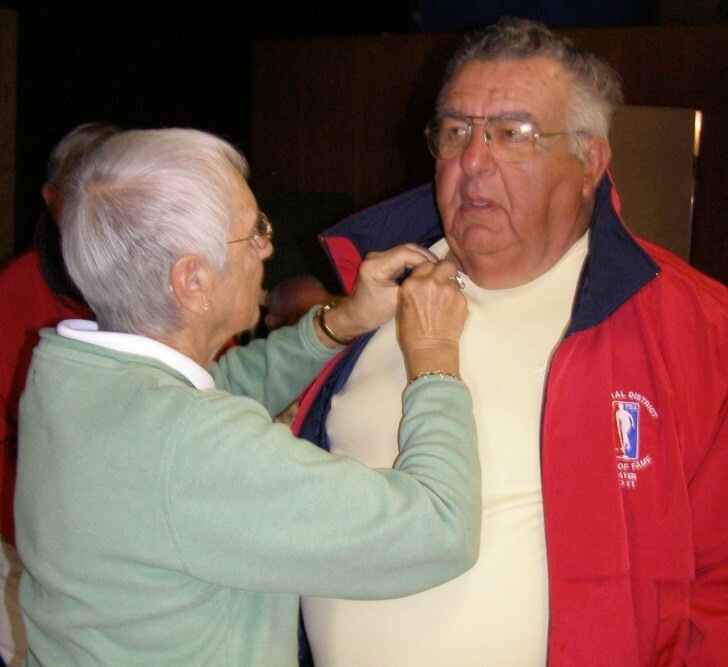 In his acceptance Gus paid tribute to those early shufflers who assisted him during his learning period, many who came from other Parks to shuffle with Gus in the morning at Winter Haven, Gus’s home club at the time. Gus has since left Winter Haven and moved to Zephyrhills where he is a staunch, loyal, active and respected member of the Zephyrhills Club. Gus is a Past President of the ISA, the US NSA and is currently the 1st VP of the US NSA. Few Shufflers devote more time and energy to the Game they love. Congratulations to Gus on his Induction into the Central District Hall of Fame. Stan McCormack. 2011 03 11.